Sonos, makers of the Sonos Multi-Room Music System ( ) and the Sonos ZonePlayer S5 ( ), has released the free Sonos Controller for iPad. 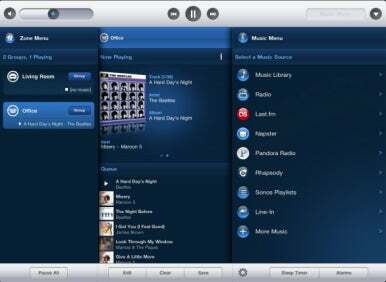 Similar to the company’s free Sonos Controller iPhone app, the Sonos Controller for iPad allows you to control all the functions of a linked Sonos system—select and search for music on a connected library or from supported music services, control the content and volume of zones, tune into Internet radio, and create playlists from both local and Internet sources. New with the iPad app is a multi-pane view that lets you control the majority of a Sonos system’s functions on a single screen. In landscape orientation you can view all your Sonos zones, the particulars of a selected zone, the music menu for that zone, and the contents of your music queue. Additionally, using buttons arrayed across the bottom of the iPad’s display, you can configure the sleep timer and alarms. You can also quickly build playlists by dragging items (albums or tracks) from your music library or a music service such as Napster or Rhapsody to the Queue pane. You can then edit, clear, or save your playlists. With the new controller comes a free Sonos System Software 3.3 update. Among its features is support for AAC radio stations, which makes available more than 100,000 radio shows and podcasts to Sonos systems. Additionally, Sonos users in Finland, France, the Netherlands, Norway, Spain, Sweden, and the United Kingdom can now play Spotify content on their systems.